Add a bright feeding spot to your bird garden with this Songbird Essentials Recycled Plastic Oriole Feeder and Jelly package. This feeder and food combination is perfect for attracting orioles, robins, and thrushes to your yard, and is a wonderful gift for an avid birder. The vivid orange tone of the Songbird Essentials Recycled Plastic Fruit and Jelly Feeder captures attention easily, and its hardy construction ensures durability. An upright, center panel supports the pitched roof, and two spikes on each side hold two orange halves easily. Use the included bottle of Songbird Essentials BirdBerry Jelly to fill the bottom, plastic cup, inviting even more birds to the area. A platform surrounding this cup provides birds plenty of spots to stand and dine, and a cable loop makes it simple to hang the unit. The feeder and dish both clean easily, and the orange hue adds a striking look to the yard. 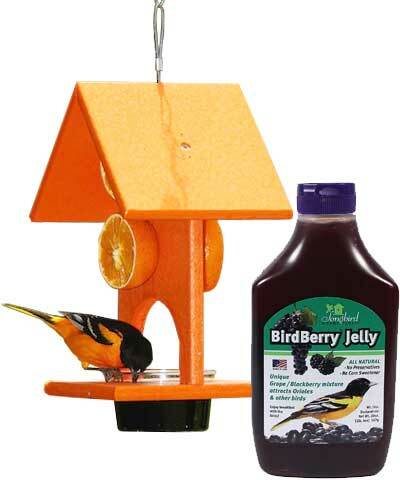 Create a wonderful oriole dining spot in your yard with this Recycled Plastic Oriole Feeder and Jelly package. Jelly made in the USA. Qty 1 Songbird Essentials BirdBerry Jelly, 20 oz.